Business cards … where to get started. Black ink on white paper has a classic clean look. 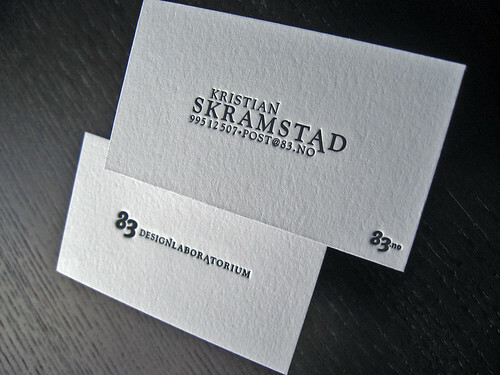 We got an inquiry a while back from Kristian Skramstad, a designer based in Norway looking to get business cards produced for 83 Design Laboratorium. 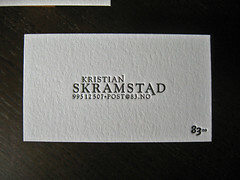 Kristian sent along a design with a slew of questions from sizes, techniques, and options. With so many options, it can be overwhelming and we’ve gotten a lot of emails from clients who want to get business cards but don’t know where to get started. We hope this post helps to answer those basic questions, and if we missed something post a comment to let us know. 1) Quantities & Minimums? We can print any quantity from 1 to 1,000,000 but for practical reasons our minimum for business cards is 200. Why 200? It’s a good balance for you and us. 200 is enough to keep the cost per card down to a reasonable level for you and is worth our time to setup and print. We’ve printed orders of 1 card but because of the cost of plates and setup, it’s not practical for most people. 2) What are common quantities? 200, 500, 1000, 2000, 5000, and so on. The higher the quantity the better the price per card. We tell clients to think about their needs for the next 6-8 months, this is short enough that you’re not likely to significantly change your branding but long enough to get the best price. For people ordering multiple sets of cards, make sure to break down the quantities into even multiples. 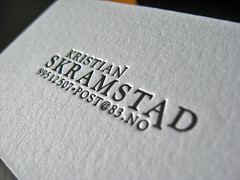 The cards we produced for Kristian were printed on two sheets of 110lb (300gsm) fluorescent white Lettra. 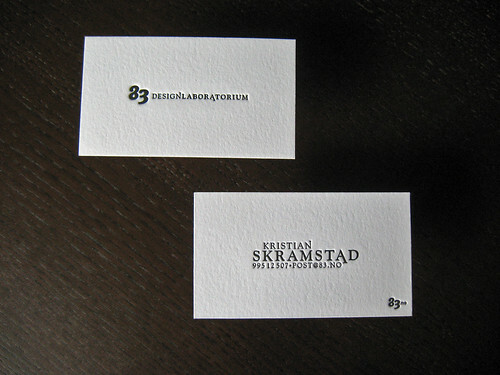 One sheet for the fronts (above-left) and another for the backs (above-right). 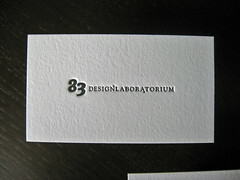 After printing was completed on both sides we duplexed the paper to create the 220lb (600gsm) card.The benefit of letterpress printing a double sided card on separate sheets and then duplexing is it allows a nice impression on both sides without bruising. 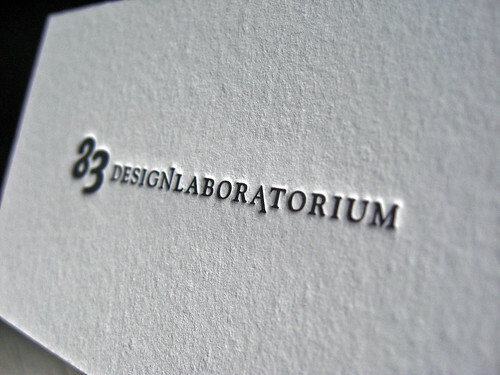 The finished card is clean and crisp, the simple design highlights the letterpress process. 3) How do I specify colors (CMYK / PMS) ? 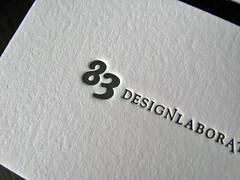 99% of letterpress printing is done with spot colors which mean every color put in the design requires another pass through the press. 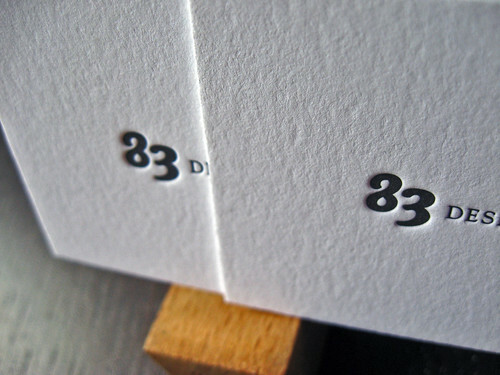 This is why most letterpress work is usually limited to 1-3 colors (… to reduce cost). 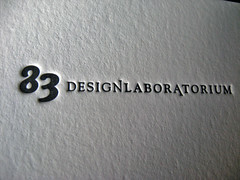 Process work, where colors are broken up into their CMYK components, can be done via letterpress. The mix of cyan, magenta, yellow, and black is used to create a range of colors. Overprinting, which takes advantage of color mixing to produce a third color, is a nice balance between process and spot colors. Designing for overprinting has a unique look and is definitely an art form in itself. 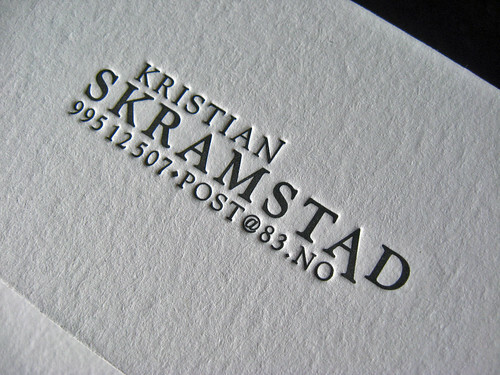 And if overprinting is an art form, letterpress process work is more like string theory. 4) What size should I specify? We went more in depth into business card sizes in a recent post: Not your standard business card (sizes). You can specify size in inches (Imperial) or millimeters (Metric). Our equipment is setup for inches but that’s nothing a calculator can’t fix! Make sure to layout your design at 100% scale and let us know what the finished size should be. 5) What weight is your paper? 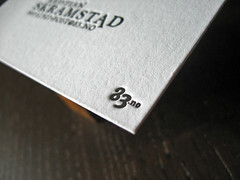 Standard letterpress paper comes in two weights: 110lb (300gsm) and 220lb (600gsm). Not all paper weights are equal though. What I mean is that weight doesn’t give any insight into thickness or softness. The 110lb stock measures in at 0.021″ and 220lb at 0.042″. We’ll be putting together a post in the next week or two that will cover paper weights and colors. 6) What about other methods? There are enough choices with letterpress that it can get confusing. When you throw offset, digital, foil, thermography, engraving, embossing, die-cutting, edge coloring, binding, and more it can be dizzying! 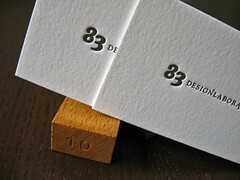 Our shop is centered around letterpress printing but we also offer all of these methods each which have their own benefits and drawbacks. We try to pull from each of these to build on their strengths and make production easier. Offering all of this in our shop allows us to keep costs down and maintain quality that can’t be done when you send it out to someone else. 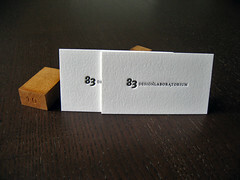 Hopefully that answers some of your questions about ordering custom business cards. If you’ve got a job you’d like to discuss with us, email us at contact@dolcepress.com, we’d be happy to help.